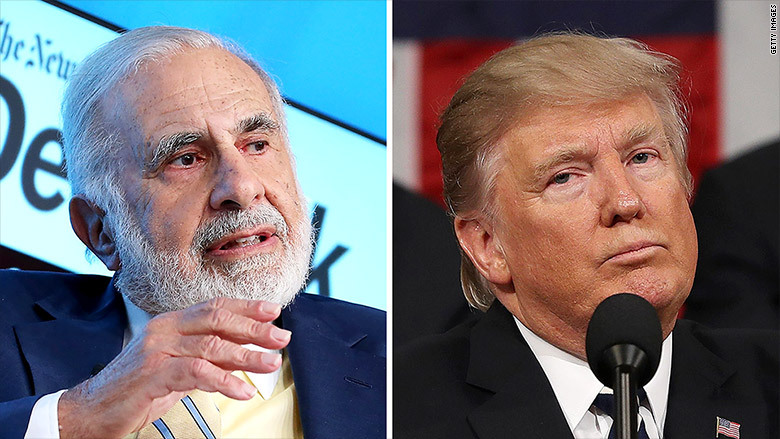 Billionaire investor Carl Icahn said Friday he has stepped down as a special adviser to President Trump on regulatory reform. He said in a letter to Trump that he was stepping down with the president's "blessing" and "because I did not want partisan bickering about my role to in any way cloud your administration." Icahn has been criticized by Democrats who said his advisory role created a conflict of interest because he had not taken a formal government job and was still running his businesses. In March, Icahn told CNNMoney that the those allegations were "absurd" and "completely ridiculous." He added, "I don't talk to Donald that often." He doubled down on his denial in the letter to Trump, saying, "contrary to the insinuations of a handful of your Democratic critics, I never had access to nonpublic information or profited from my position, nor do I believe that my role presented conflicts of interest." Exactly what prompted Icahn's decision to step away from his informal White House role was not immediately clear Friday. Neither the White House nor Icahn Enterprises, his massive investment company, responded to requests for comment. In fact, Icahn laments in his letter that he didn't have more time to discuss policy with the president. "I sincerely regret that because of your extremely busy schedule, as well as my own, I have not had the opportunity to spend nearly as much time as I'd hoped on regulatory issues," Icahn wrote. Icahn also mentions that he's "received a number of inquiries over the last month" into whether his advisory role overlapped with the duties of Neomi Rao, who Trump named as the administrator for the Office of Information and Regulatory Affairs in July. Icahn asserts those are baseless concerns: "The answer to that question is an unequivocal no," he wrote. He also expressed support for Rao. "While I do not know Ms. Rao and played no part in her appointment, I am confident based on what I've read of her accomplishments that she is the right person for this important job," he said. Trump said Icahn is the type of person he wanted in his administration early in his campaign. He told MSNBC's "Morning Joe" in June 2015 that he'd "love to bring my friend Carl Icahn" as Treasury secretary. It was a suggestion that Icahn quickly declined. Instead, Trump tapped Icahn to serve as a special adviser on regulatory reform in December.